giving | Amigos en Cristo page. 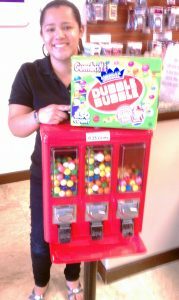 Valentina Grisales stands next to the gumball machine that her Metro PCS store donated to Amigos Center. The machine is expected to raise about a hundred dollars a month in donations. Valentina and her family have been long-time friends of the Amigos ministry, having been helped by the immigration ministry, English classes, social services, and church ministry. They are thankful for the work Amigos does in the community changing lives and are eager to give back in any and every way they can. Board Member Pat O'Donnell was featured in Lifestyle Magazine's October 2011 issue's article written by Laura Cummings. Read excerpts below or read the full article here. During the thirty-five years Al and Pat O’Donnell have lived in Estero, they have built an award-winning landscape firm as wellas a reputation for community service. 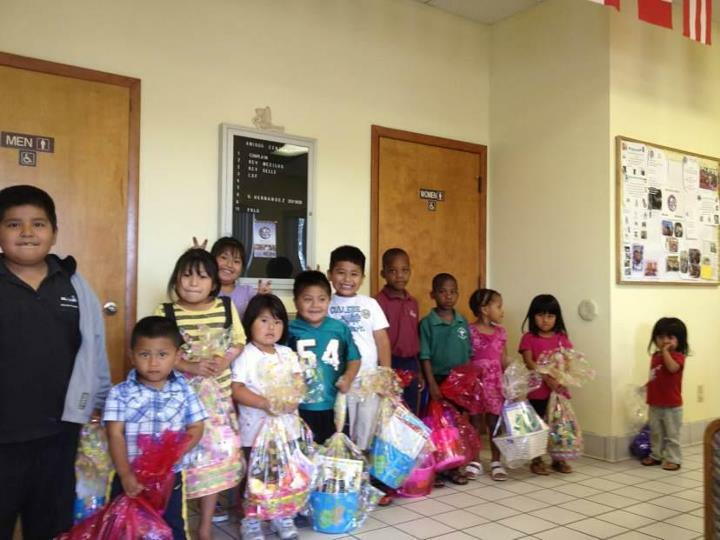 The Dubin Center is one of United Way’s seventy-two local partneragencies, as is The Amigos Center, for which Pat serves on the board.The Amigos Center helps immigrants in Lee and Collier counties filepaperwork to obtain, retain or recover their legal status. “They do alot of humanitarian work,” Pat explained. The agency helps immigrantsfrom ninety countries navigate through the complex Immigration andNaturalization Service (INS) system. “It’s a proud moment when theyfinally get through everything and get their citizenship.”Pat discovered The Amigos Center as a volunteer on the United Way’sAllocations Committee, which evaluates partner agencies and reviewsannual requests for grants. “It is an eye-opening opportunity to see whatthe needs are in Lee County,” Pat said. While the O’Donnells keep a tightly packed schedule, they wouldn’thave it any other way.“You make time for the things you really want to do,” Pat said. “Youorganize everything else around it.”Christina shared that last Friday, at 5:30, she was getting ready and packing up to go home. The door was propped open for the cleaning lady and in strides an immigration client. Thinking to herself how to gently send him home, since she was all packed up and ready to leave, he smiles at her and thanks her for the immigration work she did for him and his family four years ago. He hands her $30 and tells her it's not much but he is so thankful for the work of the Amigos Center and he is finally in a position to give back and wants to do what he can to help Amigos Center help more people. It was a great way to start the weekend. 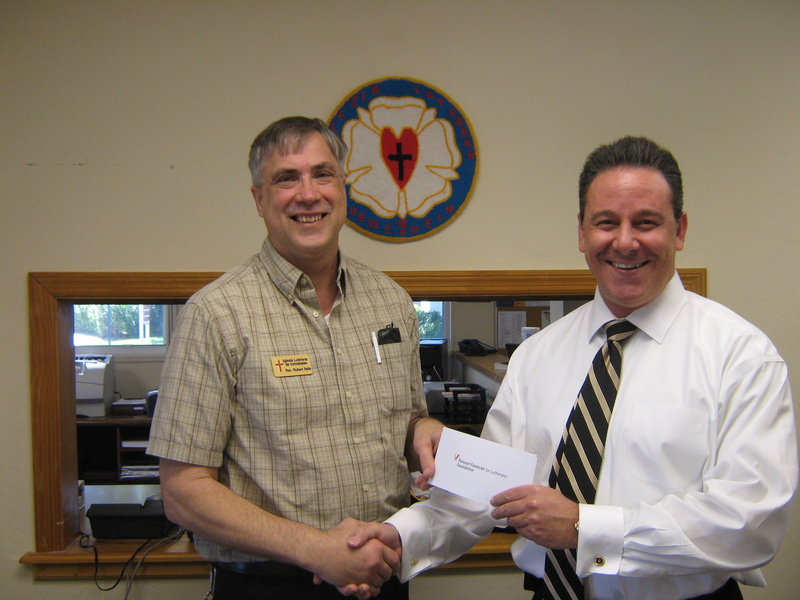 Thrivent Financial for Lutherans Financial Consultant Mark Fontana presents Pastor Bob Selle the matching $10,000 Lutheran Community Economic Outreach Bridge Grant. This matches dollar for dollar the non-pledged money that Amigos en Cristo raised during the past couple of months up to a maximum of $10,000. From November 2010 through January 2011 we raised $43,299 in non-pledged money from 79 donations ($548 per donation). This compares to the same period last year of $23,096 from 88 donations ($262 per donation). Thank you Thrivent for inspiring our donors to give more generously than ever. 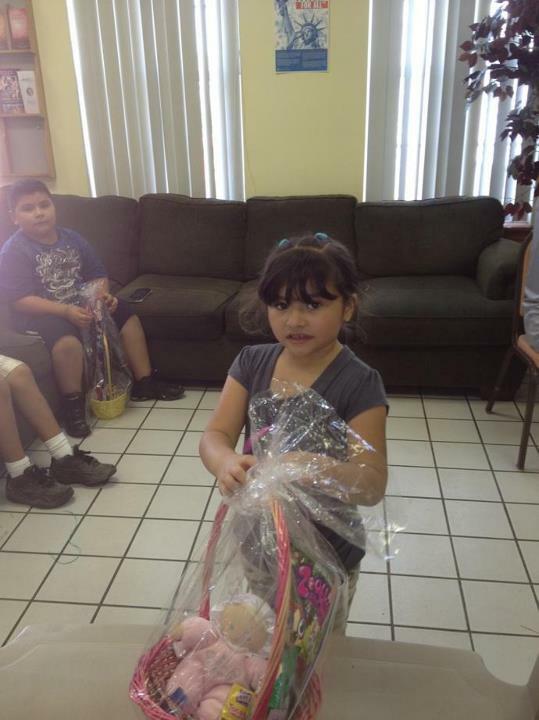 We were able to bless many children and families this Easter with special baskets to celebrate the resurrection of our Lord Jesus. It was a joyous occasion! For more pictures check out our Facebook page. 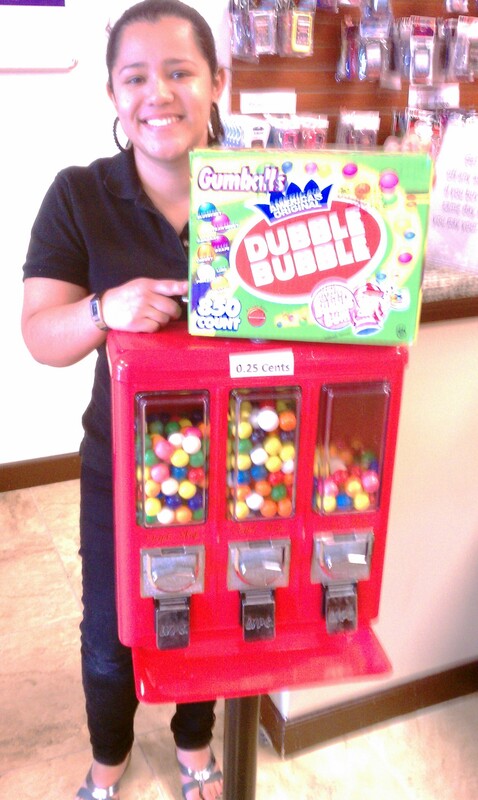 Valentina Grisales stands next to the gumball machine that her Metro PCS store donated to Amigos Center. The machine is expected to raise about a hundred dollars a month in donations. Valentina and her family have been long-time friends of the Amigos ministry, having been helped by the immigration ministry, English classes, social services, and church ministry. They are thankful for the work Amigos does in the community changing lives and are eager to give back in any and every way they can. Board Member Pat O’Donnell was featured in Lifestyle Magazine’s October 2011 issue’s article written by Laura Cummings. Read excerpts below or read the full article here. During the thirty-five years Al and Pat O’Donnell have lived in Estero, they have built an award-winning landscape firm as wellas a reputation for community service. 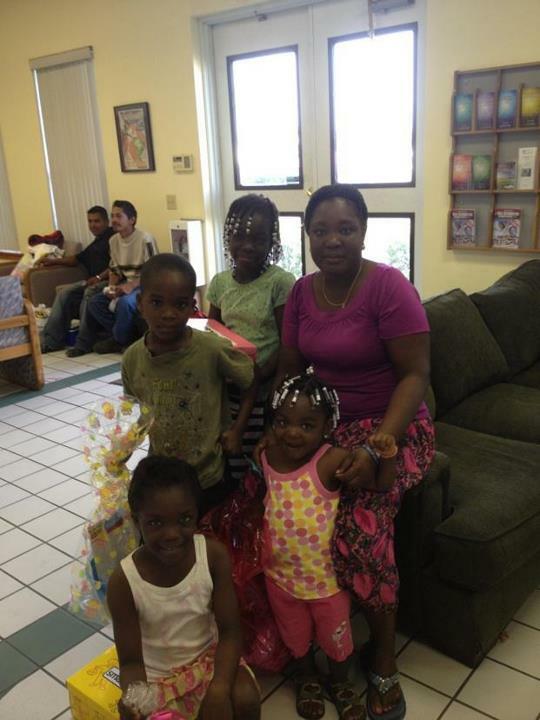 The Dubin Center is one of United Way’s seventy-two local partneragencies, as is The Amigos Center, for which Pat serves on the board.The Amigos Center helps immigrants in Lee and Collier counties filepaperwork to obtain, retain or recover their legal status. “They do alot of humanitarian work,” Pat explained. The agency helps immigrantsfrom ninety countries navigate through the complex Immigration andNaturalization Service (INS) system. “It’s a proud moment when theyfinally get through everything and get their citizenship.”Pat discovered The Amigos Center as a volunteer on the United Way’sAllocations Committee, which evaluates partner agencies and reviewsannual requests for grants. “It is an eye-opening opportunity to see whatthe needs are in Lee County,” Pat said. 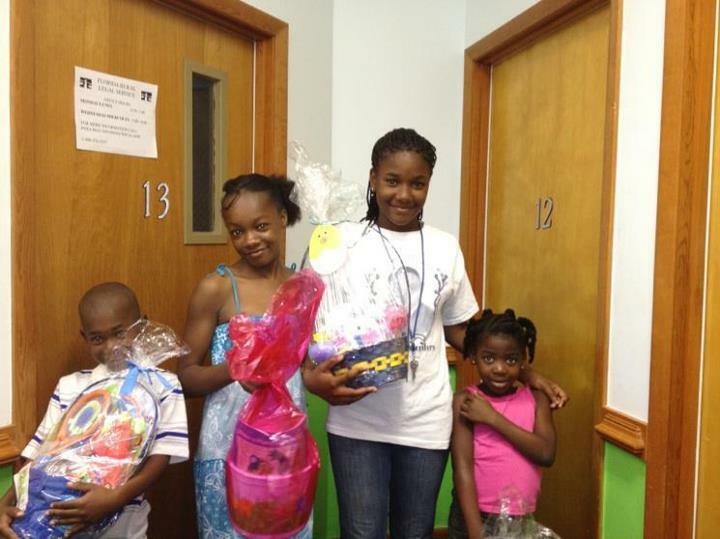 Christina shared that last Friday, at 5:30, she was getting ready and packing up to go home. The door was propped open for the cleaning lady and in strides an immigration client. Thinking to herself how to gently send him home, since she was all packed up and ready to leave, he smiles at her and thanks her for the immigration work she did for him and his family four years ago. He hands her $30 and tells her it’s not much but he is so thankful for the work of the Amigos Center and he is finally in a position to give back and wants to do what he can to help Amigos Center help more people. It was a great way to start the weekend.